Cassidy Shaver of Billings was named the recipient of a 2018 Zonta International Jane M. Klausman Women in Business Scholarship. 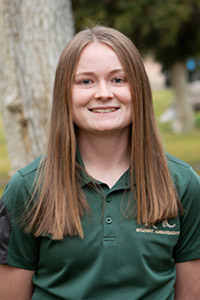 She is one of just six women worldwide to receive this honor, which includes a total cash scholarship award of $11,500. The Zonta Club of Billings will recognize Cassidy at their annual Holiday Party, to be held Thursday, Dec. 13 at 6 p.m. in Prescott Hall. Ms. Shaver was chosen as a Jane M. Klausman Women in Business Scholarship recipient because of her exemplary scholastic record, her dedication to helping others, and her demonstrated leadership skills. She is currently a junior at Rocky Mountain College in Billings, where she is President of the RMC Business Professionals of America chapter, a tutor in the Academic Resource Center, a student ambassador volunteer, and a LEAP peer mentor. She is earning B.S. degrees in Psychology and Business Management, and a Masters in Accounting. Her goal is to attain her CPA license and open her own accounting firm in our community, where she can continue to “give back.” Ms. Shaver recognizes the importance that women play in leadership roles, both in the business world and in community service. Zonta Club of Billings is a local chapter of female business professionals that is part of Zonta International’s District 12. Zonta International (ZI), with world headquarters in Oak Brook, Ill., USA, is a leading global organization of professionals empowering women worldwide through service and advocacy. The Jane M. Klausman Women in Business Scholarship Program is one of many programs for women and girls sponsored by ZI. The Scholarships are funded by voluntary contributions to the Zonta International Foundation. Applications for the 2019 Zonta International Jane M. Klausman Women in Business Scholarships will be available on the Zonta Club of Billings website in March 2019.